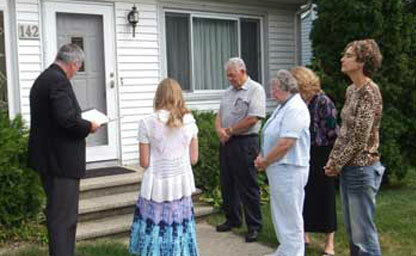 On September 24, 2011, Bob and Marilyn Logan had their house blessed. This spiritual event paved the way for the prayer group that would be (and now is) meeting the second Thursday of every month. All are invited to come and if anyone needs a ride, please contact Fr. Keough. Also note that we are currently gathering at a Mexican restauraunt prior to the prayer meeting. Again, contact Bob and Marilyn or Fr. Keough for more information.